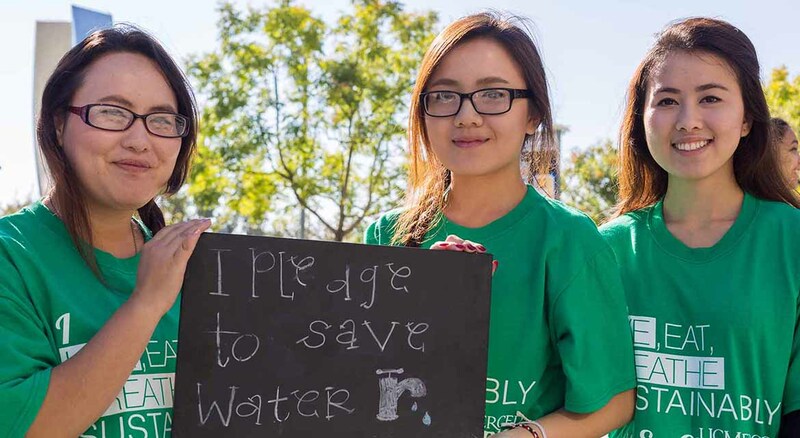 UC Merced is a green school, but remaining that way — and getting greener — depends, in large part, on you. Each month, you’ll get some new tips on living sustainably on and off campus. Here’s how you can make sustainability a part of your everyday life. Shopping local maximizes your purchasing dollars by reducing fuel costs, funneling more money into the local economy and preserving jobs for small-business employees. Have you considered going paperless? See if you can go all week without printing. This week's theme is to go digital. Today, we encourage you to reduce the paper you receive by choosing to receive all account statements via email or to access online. It's a common option offered by banks, insurance companies, utilities and credit card companies. Regulate your own temperature needs by layering – allowing you to bundle up and peel off clothing as needed. Keep your head, hands and feet warm this chilly winter season. Get rid of that small space heater and layer up instead. Sweaters and blankets are safer, more efficient – and more stylish. Doing the laundry soon? Make sure to hit the cold setting. Washing in cold water saves 20% to 30% on energy use. Saving energy is saving money. If you see warm equipment next to your room temperature sensors, make sure to move it aside to keep your sensors accurate. Consider using a train, bus or carpool as your mode of transportation. They use less fuel than single-occupancy vehicles and often cost less.